BORN with a silver spoon in her mouth, Shalimar Sharbatly, is a young Saudi painter belonging to a famous business family. Her father is one of the most influential businessmen in Saudi Arabia and her mother, herself a painter, is a graduate of a fine art college in Cairo. Into this environment of money, art and culture, Shalimar was born. She grew up in an atmosphere of art and wealth. Paintings were everywhere. Her mother’s artwork decorated the rooms, the halls and passages of their villa in Jeddah. Shalimar — meaning garden — was brought up amidst color, brushes, pens, paper and tableaux. She was familiar with the tools of art from early childhood. Her mother’s encouragement and support helped make Shalimar turn to painting early on. “My love for painting began in my early years. I still have picture which I painted when I was only three years old,” she said in an exclusive interview with Arab News. “Painting was the way I expressed my pain and joy,” she said adding that she was painting her mother as a flower “because her presence kindled in me a beautiful feeling for life”. Shalimar said she had her first show in Cairo in 1988 when she was only 16. Famous Arab painters, poets and men of letters, including the renowned Egyptian painter Salah Taher and the famous poet Farouk Juwaidah, commended her works. “This was the portal through which I entered the world of shows and exhibitions,” she said. Shalimar will organize an exhibition in Marbella in September with two well-known Spanish painters. In addition to local and foreign galleries, Shalimar did wall paintings in the streets and squares of Jeddah. By doing so, she put an end to male monopoly of wall paintings. 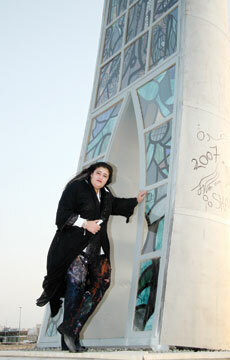 She has a 1.5 meter wide, 3 meter high painting on the Jeddah Corniche in addition to a 17 meter long painting in front of Guest Palace where the government lodges VIP visitors. “If I had the opportunity, I would do wall paintings in many Arab and other cities and towns because, in addition to decorating streets and squares, it is a visual way of spreading cultural and artistic thought,” she said. “I was recognized as a painter when I was 29 and I consider painting to be a responsibility rather than a social glory,” she said adding that painting is a means of expressing feelings and getting those feelings out. Shalimar is not happy about art criticism because “ some of those who practice it are only impressionists and not serious critics.” She said some Arab critics use words which are obscure and difficult to understand. “The language of art can only be understood by people with aesthetic taste. Our history is replete with poetry and poets and not with art and painters,” she said. She added that at present the Arab world, including Saudi Arabia, is witnessing progress in art. Shalimar said she did not paint when she is sad because anger may cause mistakes. She also said she started painting on the left and signed on the left corner of the canvas. “I do not like emptiness. I fill the entire canvas with shapes and colors. I am not afraid of colors and use them freely according to the demands of the painting itself,” she said explaining that her favorite color is turquoise. Shalimar urged the authorities in the Kingdom to establish a Ministry of Culture whose sole function would be to promote culture and art. “Such a ministry would organize all aspects of creativity and put an end to such malpractices as theft and plagiarism. Since 2006, a total of 30 of my paintings have been stolen by others who put their names on them,” she said. Shalimar said she does not usually look long at her finished works. “I do not like to look to the past or live in it. Once these paintings are finished they are finished. I live with art 24 hours a day. All my personal belongings have an artistic touch in them,” she said.